COMMUNITY members visited residents at a care centre on Christmas day to extend season’s greetings and hand out chocolates. 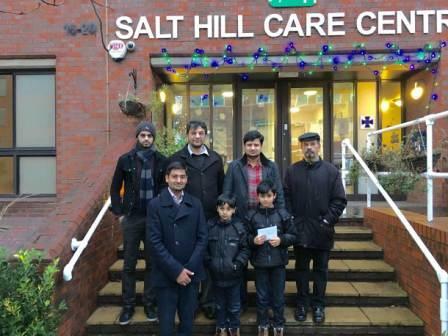 Members from the Ahmadiyya Muslim Community Slough and Burnham visited 50 residents at the Salt Hill Care Centre, in Bath Road, Slough, on Christmas Day to offer a bit of festive cheer on a day which is all about coming together. Atiq Ahmad Bhatti, vice president for the Ahmadiyya Muslim Community Slough, said: “One of the core values of Islam is to serve humanity and in particular, great emphasis is placed on the rights of the elderly, one’s neighbours and people in need. Share the post "Community comes together at Christmas"